The Williamstown municipality contained Newport and Spotswood. Housing construction took place in the 1950s in Spotswood and housing was built on the decommissioned Williamstown Rifle Range in the 1990s. By then the older parts of Williamstown were undergoing a residential renaissance, attracting people with a preference for historic renovation. Access by car across the West Gate Bridge in 1978 made Williamstown a “gentrifiable” inner suburb. A population peak of 30,606 had been reached in 1961. By 1991 it was 22,100, despite the number of private dwellings having increased from 8,228 to 8,856. 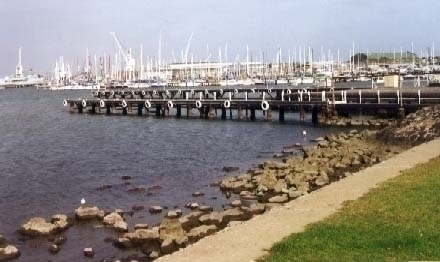 Williamstown’s shoreline features remained much the same from 1900 to the present day: numerous piers and recreational sailing facilities facing the calmer waters of Hobsons Bay, the Williamstown Cricket Ground and football club on Gellibrand Point, facing Port Phillip Bay and the beach (served by Williamstown Beach railway Station) a little to the west. The web of railway lines serving four piers and the graving dock were dismantled in the 1960s. There are 15 sites in the former Williamstown municipality on the Victorian Heritage register, including the Railway Station and the Alfred Graving Dock. On 22 June, 1994, Williamstown city was united with Altona city and parts of Footscray and Werribee cities to form the City of Hobsons Bay. 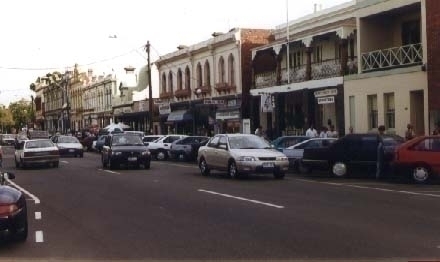 Historical Cafe Strip, Williamstown, 1997. Davison, Graeme (ed. ), “Melbourne on Foot: 15 walks through Historic Melbourne”, pages 168-83, Rigby Publishing Ltd, 1980. Evans, Wilson, “Port of Many Prows”, Hawthorn Press, 19??. Strahan, Lynne, “At the Edge of the Centre: A History of Williamstown”, Hargren Publishing Company, 1994.